After making contact with @ReneJansen, of the Dutch company “Winkwaves“, he invited me to the launch of the rebranding of their Social Enterprise software. This took place in their office in The Hague. The old name Kenniscafé (Knowledge Café) was dropped in favour of Harmonics. And I think that’s a good choice. It better embodies the philosophy the company has about social business. The absolute foundation of their philosophy is connecting people. It sounds like an open door, or even a cliché, but a lot of companies are still firmly siloed and internal communication is not necessarily a priority. We enable people to connect through technology. This kind of innovation and change is a process in and of itself. Lastly we transform the actually way we do our work. This process is inherently difficult to complete within a company. Since days of old companies are build like a machine. A top down controlled collection of cogs, well managed and meshed together to perform certain tasks and a predictable end product. Doing business this way becomes more and more difficult. People are getting more and more used to communicating through social media and they expect companies to communicate in a similar fashion. Not just with them as a customer, but also with them as employees. They expect a more open structure. A consequence of having a structured and siloed company is the inability to flex.., to adapt. In “the old days” this wasn’t really a problem because things didn’t change that fast, innovations were controllable, maybe even predictable. In the digital age it all happens so much quicker. Kodak and Polaroid couldn’t keep up and a lot more across different industries just couldn’t adapt quickly enough.., and failed. Giving employees the ability to communicate quickly, find knowledge and share experiences throughout the company enables flexibility. For instance, issues can be identified and acknowledged before they become problems. Or, change the way people connect with each other. Provide them with the tools to fundamentally change the way they perform their job. Software enables change and facilitates behavioural adaptation.., but.., people need to drive the change. In the end it would take less energy/time/money to maintain the machine. HR should be more about the ‘H’ than the ‘R. Of course.., implementing and changing is one thing.., it all needs to be kept together. Questions need to be answered.., who are we, how do we do our jobs and most importantly.., why. People will become more and more involved. 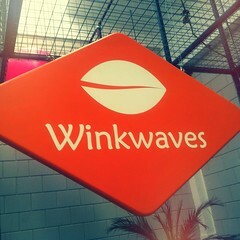 Winkwaves doesn’t create a long term development path for their clients.., nor for them selves. The idea is that they don’t know where innovation is heading, that nobody knows for sure where we’ll be in two years. Neither does the customer (we can plan and hope, but obviously we don’t have a crystal ball.., we only wish). They innovate by listening to the customer, to the market and keeping two eyes on technological developments. Then they implement, small, incremental changes. This enables Winkwaves to adapt quickly to change, not to be left behind or to be caught off guard. They take their own philosophy very serious.